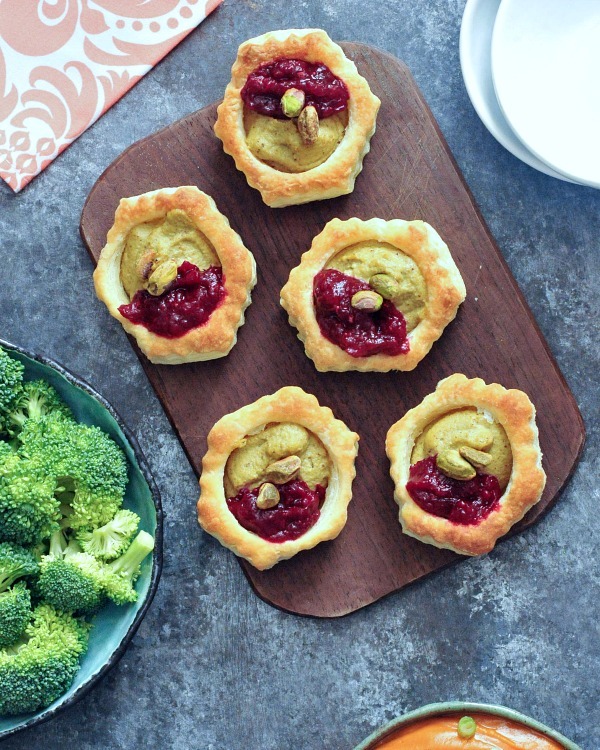 These Garlic Pistachio Cranberry Tarts are one of those recipes I cannot wait to make again, we all liked them that much! 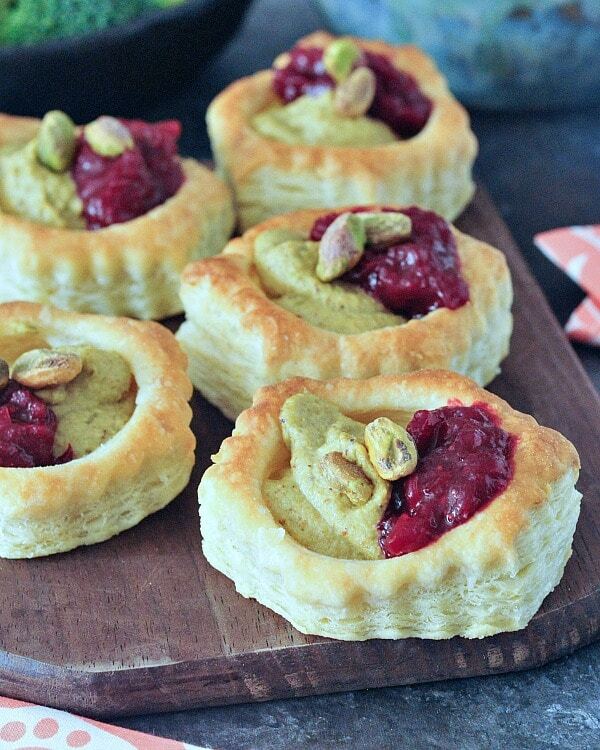 The garlic onion pistachio filling is one I keep thinking of, coming up with new ways to use it. Although ‘by the spoonful’ is a good choice. These have such amazing flavors, people that actually like turkey may not miss it. 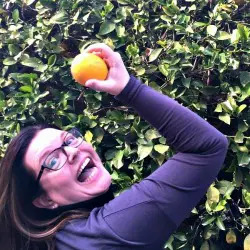 I only wish I had thought of these years ago – I never ate turkey. 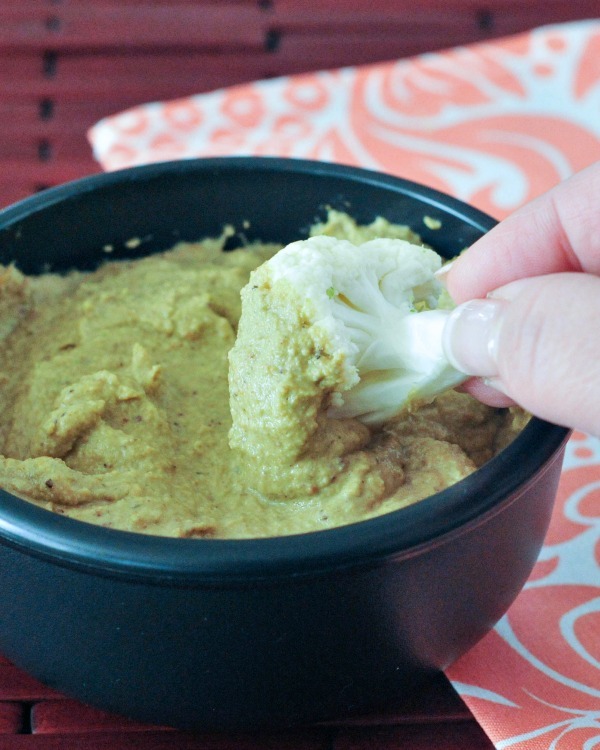 I have also made a gluten free version that tastes just as good – simply using a gluten free pie crust. So yum! Reserve several (12) pistachios to use as garnish. 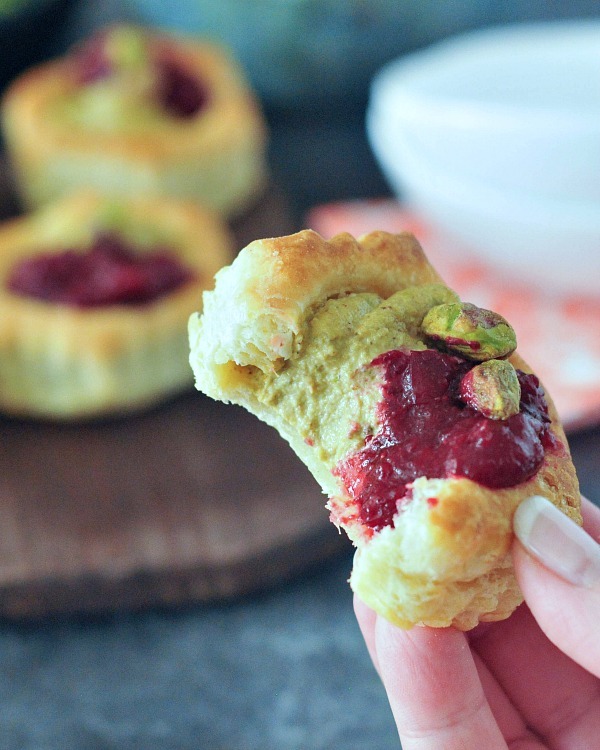 Combine pistachios and 2 tablespoons water in blender, blend at highest speed until almost creamy. While blending, add garlic, onion powder and salt. Add water as needed to reach desired consistency, 1 tablespoon at a time. For this recipe, I wanted it thick enough to pipe into tart shells, and have used anywhere from 2-5 tablespoons. 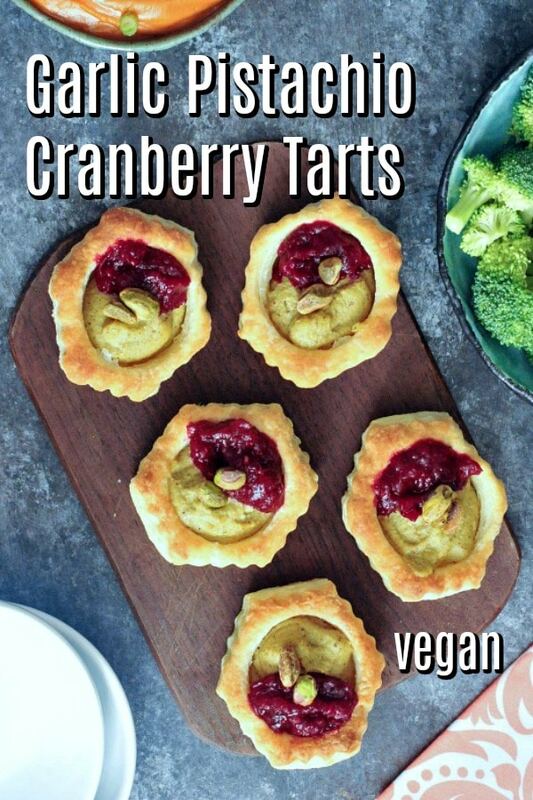 Cook tart shells / pie crust according to package. 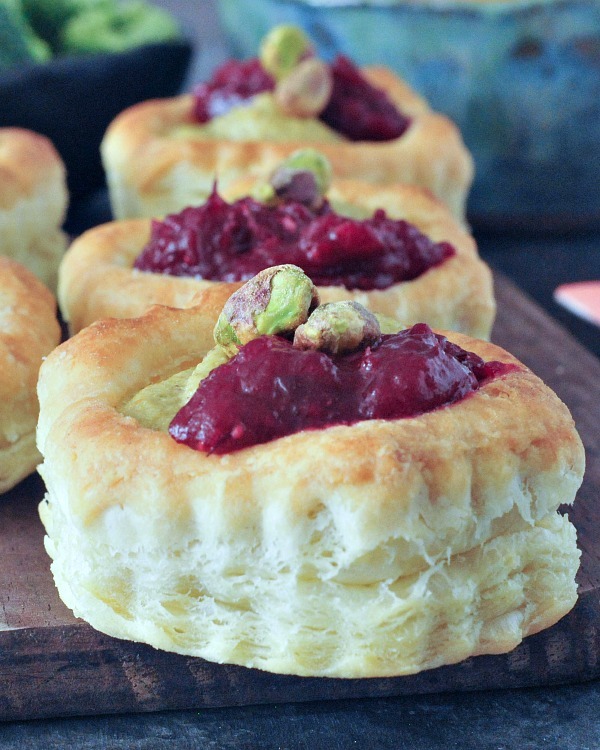 Pipe about 2 tablespoons garlic pistachio spread into each, and top with (about a tablespoon) ginger cranberry sauce and a pistachio. These are great served warm or room temperature. Do you love The Princess Bride? 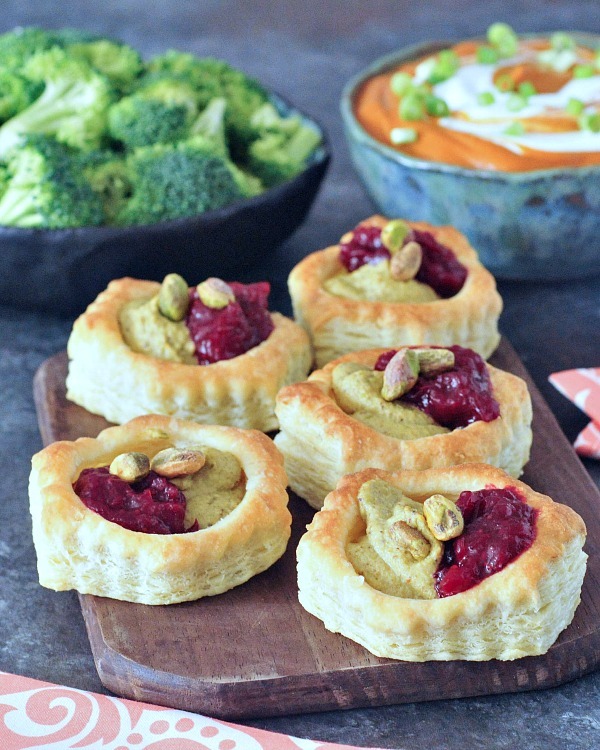 Garlic Pistachio Cranberry Tarts - rich and colorful pillows of flavor, perfect for the snacky spread while watching the game, and all through the holiday season! FYI doesn’t look so pretty if you crush the pistachios with a mortar and pestle. LOL I do not own a chopper and my blender is down for the count! Tasted wonderful, but ugly presentation. I made a gluten free crust with Namaste flour, butter flavored Crisco, milk, apple cider vinegar and some crushed thyme. Just a touch of the cranberry raspberry ginger sauce with added nutmeg and cinnamon, YUMYUMYUM!! Perfect with a side turkey! ah, I am sure they weren’t ugly, ha! glad the flavor was good, we love these!